As a parent, what is the total amount you expect to spend on back-to-college items this season? 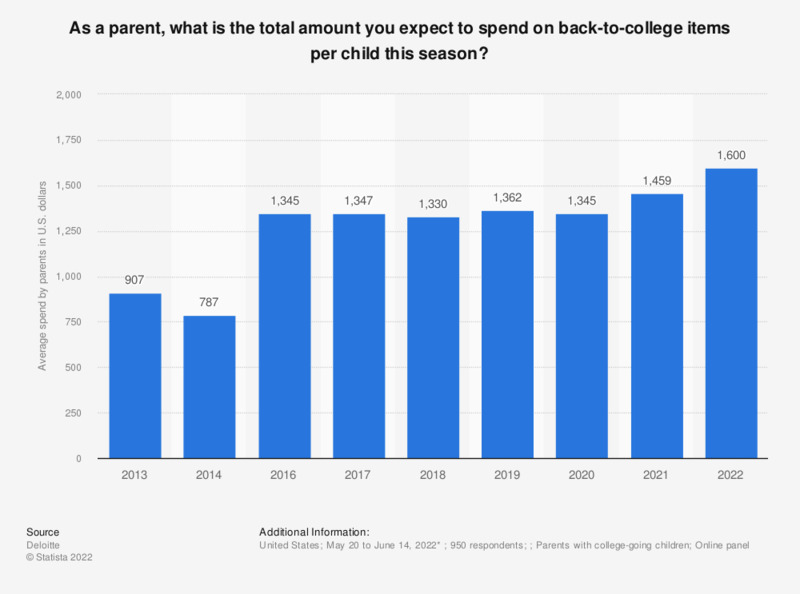 The statistic depicts the results of an online survey concerning the expected back-to-college spending of parents with children in college in the U.S. from 2013 to 2018. In 2018, parents expected to spend an average of 1,330 U.S. dollars on back-to-college items. * Date and study characteristics apply to the 2018 survey. Previous years were conducted among equally large samples. The survey has a margin of error of +/- 3 percentage points. The source does not provide any information regarding the exact age of respondents. Figures prior to 2018 have been taken from previous editions of the publication. Everything On "Back-to-college market" in One Document: Edited and Divided into Handy Chapters. Including Detailed References. How much are you willing to spend on back-to-college supplies compared to last year? Which payment method do you plan to use most often when purchasing for back-to-college? What is the total amount you [parent] and your children expect to spend on back-to-school items this season? Are you more confident about the U.S. economy's prospects now (July 2015), than you were at the end of 2014? What is the total amount you (parent) and your children expect to spend on back-to-college items this season? Thinking of your household's assets (home, cash, car, etc.) and your liabilities (credit card bills, mortgage, etc. ),how is your household's finacial situation today? How are you likely to change the way you shop for back-to-school items this season because of your concerns about the U.S. economy or your household's finances? Do you own a smart phone? Do you agree that nowadays, with respect to the past, parents defend too much children in front of professors? What age was your child when you first made the following action? How important do you think it is that a child has his or her own library card? As a parent, what is the total amount you expect to spend on back-to-school items this season?